Having reached the stage at the end of October where the underframe of 93 was nearing completion it was time to call in the Society's Vehicle Inspection Body in the form of Delta Rail's Roger Townend to do a document and hardware audit, to obtain the appropriate ticks in the appropriate boxes to enable the vehicle to traverse Network Rail's metals. This audit had to be done before the body is dropped back on to the frames in order to have unrestricted access to the new steelwork and riveting that was required to convert the frames back to railmotor configuration, as well as an inspection of the vehicle's systems and controls. Accordingly the efforts of Llangollen's engineering team were put under close scrutiny at the beginning of December, and we are pleased to report that our VAB was impressed by the standard and quality of the work done to date, and apart from a couple of very minor items has given us a clean bill of health. 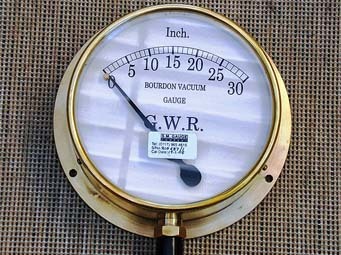 As a concession and slight (very slight) softening of the Didcot slave driver relentlessly pushing for faster and faster progress, the Llangollen team will now be allowed to have a few days rest over the Festive Holiday - Bah, humbug ! The accommodation bogie fitted at the power end. 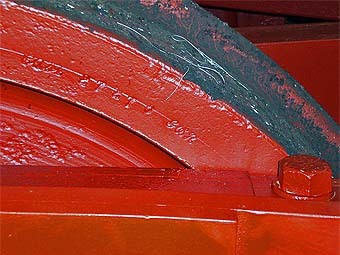 Note that the centre of this bogie is not on the same alignment as the power bogie, which sits equidistant between the scroll irons. It is pleasing to report we now have a rolling chassis, with the installation of both the trailing and accommodation bogies. 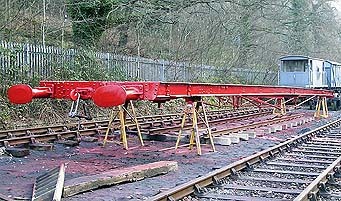 The underframes were taken for a short trial run through the yard at Llangollen to prove that the bogie modifications are successful and that clearances between the bogie and scroll irons were sufficient when negotiating tight radius curves. A view along the underframe showing the growing clutter. Left to right are the front vacuum cylinder, the water tank and the front gas tank. Yet to be fitted in the centre gap are the water supply and feed pipes. Work has continued during October with the completion of all the trailing end driving controls up to the interface of the power bogie together with final manufacture and connection of the handbrake linkages. The water tank has also been installed enabling the supply and feed pipes to be made. Attention has also been focused on the retractable steps, with the manufacture of supports, linkages and operating levers currently underway. New screw couplings have now been delivered to enable the draw gear to be completed. 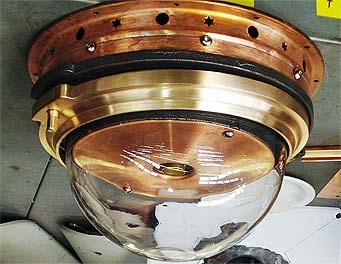 One of the reproduction gas lamps. Progress continues on the body, with new knee irons made and fitted, together with continuing work on the trailing end structure. We have also now received the replica gas lights and roof vents from Sugg Lighting ready for installation at the appropriate time. Some good news on the power bogie - We have at last had some success with finding a suitable forge master to make the outstanding motion parts for the power bogie and it is hoped to place orders for these items shortly. 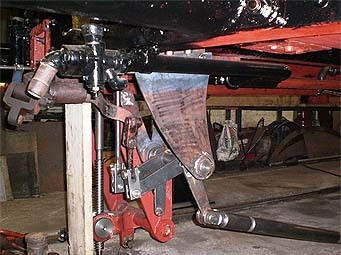 The trailing end regulator cranks and linkage in position. Also in this view are the handbrake screw and cranks together with the steam heat pipework. 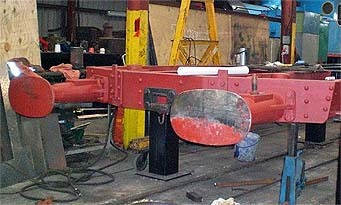 The accommodation bogie ready to fit under the power end of No 93 viewed in Llangollen's workshop. During September work has concentrated on the coach systems, with particular attention being focused on the regulator linkages. The various cranks and rods have been manufactured, and these have now been assembled on temporary supports to prove the geometry. 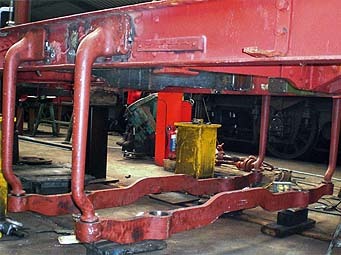 The rod that runs the complete length of the vehicle to connect the trailing end regulator handle to the boiler main steam valve - an ex auto trailer spare acquired from the WSR - has been modified and fitted on new brackets. 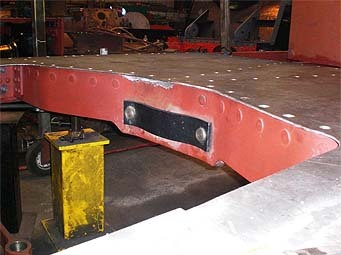 We can also report that the accommodation bogie has been overhauled and the modifications required to allow it to fit under 93's power end have been designed, fabricated and fitted to the bogie. An end view of one of the gas tanks - The top strap holding the tank in place and the hardwood packing are original and were found when the frames were stripped for restoration. The completed water tank ready for fitting, showing water inlet pipe flanges, top air vents and hanging straps. Although we have been through the main holiday period steady progress is still being made on the underframe, with both the main water tank and the two gas tanks being completed. 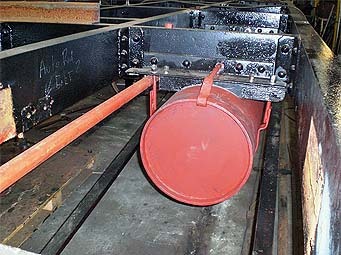 The gas tanks have been installed, but the water tank cannot be fitted until the frames are lifted off the support stands onto the bogies, as there is insufficient ground clearance at the moment.The two vacuum cylinders and pipe systems have been installed and tested, both power and trailing end handbrake systems have been manufactured and fitted, together with the steam heat pipe. 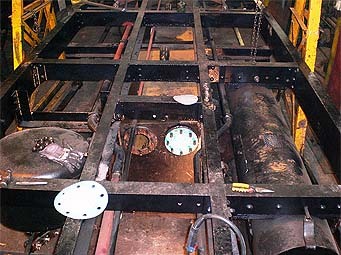 The steel footplate sections have been profiled using the originals removed due to heavy corrosion as patterns, and these have been fitted to the boiler compartment frames, Final riveting has been done on the scroll irons, and the buffing springs that transmit motion from the power bogie to the frames have also been installed. 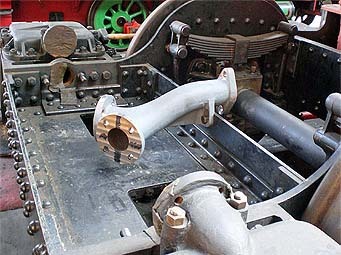 Looking between the frames under the boiler compartment footplate at the handbrake lay shaft and operating rod. 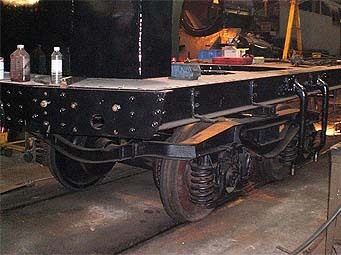 Part of the boiler compartment footplate and the rear traction spring fitted to the underframe transom. Work on the body structure has regrettably slowed over the last couple of months due to a combination of staff holidays and the long term sickness of one of the key workers. However we hope that the situation has now been resolved and we will soon be able to report that we are back on programme and that substantial progress is again being made in this area. 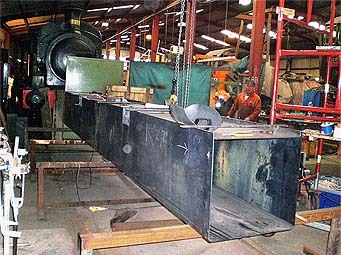 Continuing work on the power bogie and boiler has seen most of the machining work completed on the brake system, including casting of the brake blocks and the fabrication of the brake hangers. All the secondary suspension components have also been machined and are ready for fitting to the bogie at the appropriate time. 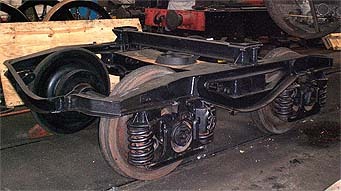 During May and early June more work has been done on the underframe and body. On the underframe both the trailing and power end buffer planks have been riveted into position together with the rear boiler transom. 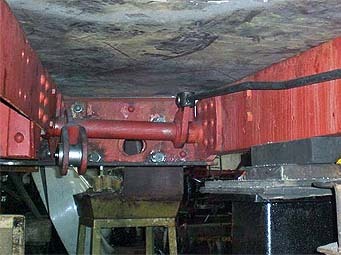 Work on the trailing bogie is complete, with the exception of the sand hoppers, which are currently being manufactured. The water tank is being assembled, and work has commenced on the hand and vacuum brakes together with the auto control systems. 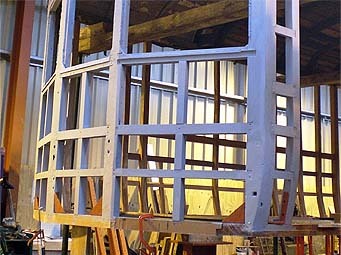 Regarding the body, the power end body now has all the main construction wood in position and work is progressing on reconstructing the trailing end driver’s vestibule. Meanwhile work has continued on the Power Bogie at Didcot the cast ‘Y’ piece for the exhaust steam has been delivered and fitted, and off site the final machining of the piston rods has been undertaken, and the rods fitted to the crossheads. 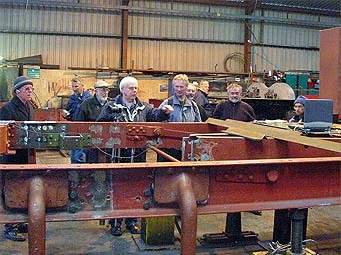 Work continues on the underframe with the rear boiler transom manufactured and located in position together with the scroll irons and suspension girders. A detailed dimensional check was undertaken to ensure that all components were correctly positioned before being tack welded in place prior to final riveting. 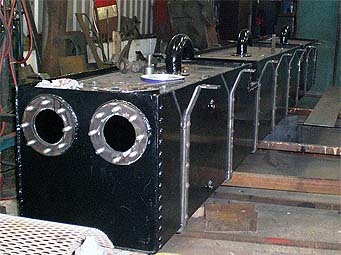 The coal bunker has been manufactured and is ready for fitting at the appropriate time, and the trailing bogie has had the brake gear assembled, leaving the sand hoppers and guard irons the only items to be done before replacing in the frames. 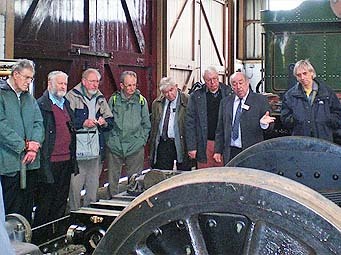 A contributors' open day was held, at Didcot, on April 29th followed by a Great Western Society members' open day on May 3. 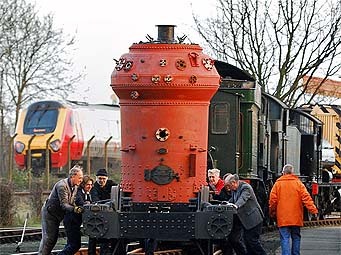 These events offered the first public viewing of the boiler in position on the power bogie. Both events were well attended and generated considerable interest. 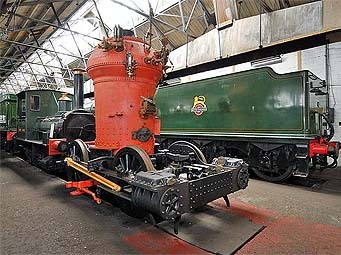 The power bogie and boiler will remain on display in the engine shed at Didcot until the end of the year. The Llangollen railway's workshops were opened to visitors, during their spring gala event, and one of the exhibits attracting most comment was the under-restoration frames of the steam railmotor and its trailing bogie. The GWS staff stewarding the 'exhibit' were kept very busy answering questions ranging from the general 'what's this then ?' to the highly technical. Plenty of leaflets were handed out, so we hope to attract more supporters to the project. In addition to the workshop display, visitors on Saturday had the opportunity to ride in a magnificently restored auto-trailer, hauled by Pannier 6430, to the Pentrefelin Carriage Workshops. 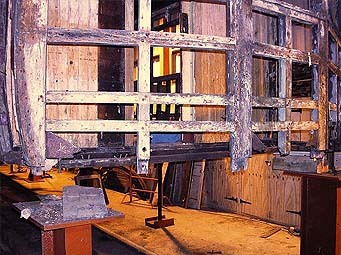 Amongst other projects, visitors could inspect progress with the woodwork repairs to the framing of the railmotor body. Some two to three hundred people availed themselves of this opportunity during the day. 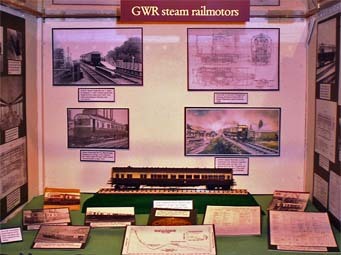 The Great Western Trust is celebrating the railmotor project by including an exhibition of artifacts and photographs in the Society's Small Relics Museum at Didcot. 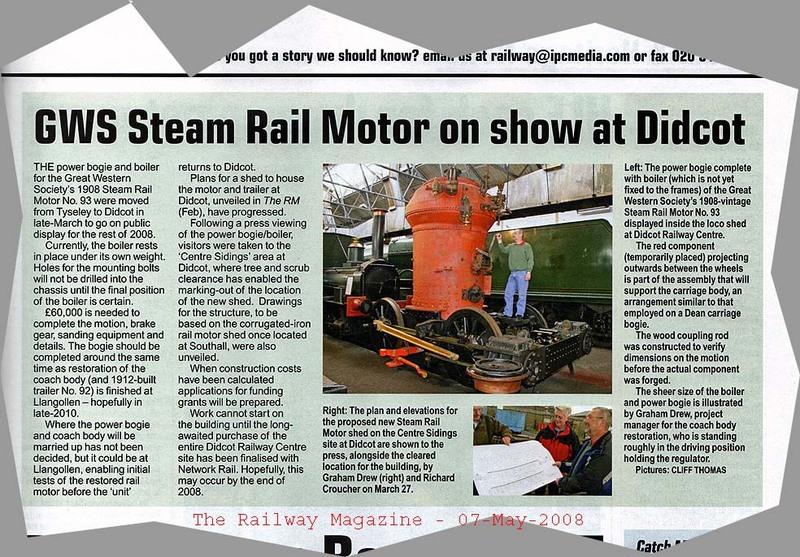 The exhibition can be viewed at any time Didcot Railway Centre is open and will stay in place until Christmas 2008. One wheel appears to rest on the cab of a passing InterCity 125 whilst the bogie is being lowered onto the rail wagon for the shunt to the railway centre. The power bogie being shunted. As a representative of the first generation of multiple-unit trains it provides an interesting comparison with the passing cross-country Voyager. Several generations down the line the Voyager is one of the newest multiple units. The nearly complete power bogie and boiler assembly for the Steam Railmotor Project arrived at Didcot Railway Centre today. 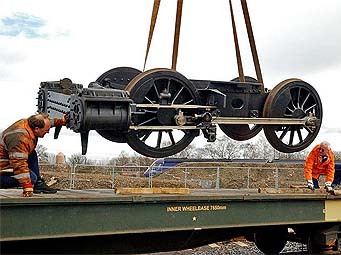 The bogie and boiler were delivered separately by road, and then moved by rail to Didcot Railway Centre, where the two parts were assembled using the 50 ton hoist in the lifting shop. The assembly will be on public display in the Engine Shed during the summer season when it can be viewed at any time the site is open. This, of course, will be the only opportunity for you to see the boiler and bogie ‘in the raw’ before it is encased in the coach body, so don’t hesitate to come and have a look at this unique sight. There will be an open day for those interested in the Railmotor Project on Saturday 3 May when you can meet the Project Team and also see the engine in the flesh. Work in currently progressing on both the underframe and trailing bogie, with the bogie being stripped, cleaned, and inspected. The springs have been sent for re-tempering and minor repairs have been done to the frame suspension brackets. The bogie is currently now being reassembled. The initial part of the trailing bogie restoration process had been the shot blasting of all the components to remove years of grime and oil so that detailed inspections could be undertaken. One of the items that has come to light during this inspection has been "GWR" monograms stamped on the wheels. 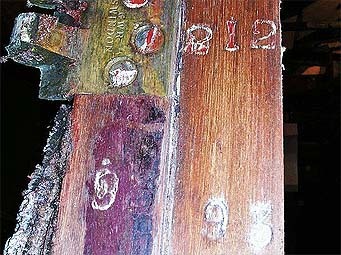 The underframe is currently in the engineering works at Llangollen, has been set up true and level by adjusting the Queen posts, and has had both buffer planks removed prior to replacement with new, together with the first 18" of main frame on the trailing end - this is where corrosion has been found behind the wooden step locations. The buffer springs have been sent away with those from the bogie, and the trailing end sand boxes, valves and operating linkage have been overhauled. The boxes proved to be sound and fit for re-use, much to our surprise. About three quarters of the components required for the restoration have now been ordered, and deliveries are being made on a regular basis. This exercise is being undertaken by Project Manager Graham Drew, who in conjunction with Richard Croucher, the Project Fundraiser, is also filling in the reams of paperwork that the HLF demand is submitted every time we make a claim on the fund. One item recently delivered has been has been 40 metres of specially woven material for the roller blinds. This has been made for us by the Nederlands Textielmuseum in Tilburg, Holland, and has been organised by Didcot regulars Freek Labohn and Aline Pastoor. The package, which weighed 30kg, was opened by customs as it probably looked a bit "iffy" - bet they wish they hadn't done so - must have been a nightmare to repack! Work in progress on the Project will be available for inspection on Saturday 19th April when we have arranged a public open day to coincide with Llangollen Railway’s Spring Gala. The underframe and bogies will be on display in the goods yard and workshops at Llangollen station, and the body will be available for inspection in the carriage workshop at Pentrefelin. It is proposed to run GWR locomotive 6430 with two autotrailers between the two locations, as the walk is just too far for comfort. The train will run on an as required basis between 11.00 and 16.00. GWS project staff will be on site to answer all your questions, and to persuade those who have not already signed up to part with some cash towards finishing the power bogie! The Llangollen Railway is planning a three day gala based round the launch of the ‘Patriot’ project, together with an LMS theme, as well as the Railmotor event (which you should note is only on the Saturday), so there will be plenty to see. 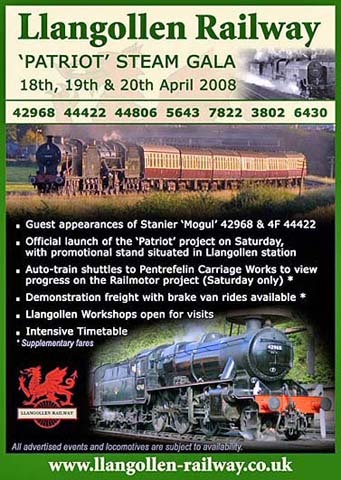 The Bristol Group of the Great Western Society are organising a “Mini-Roadmotor Outing” from the Bristol area specifically to visit the Llangollen Railway for this event. In order to move the project forward it is planned to transport the boiler and power bogie to Didcot for display in the Engine Shed very shortly and to hold an open day for Great Western Society members on Saturday 3 May when you can meet the Project Team and also see the engine in the flesh. The assembly will then be left on public display during the summer season when it can be viewed at any time the site is open. This, of course, will be the only opportunity for you to see the boiler and bogie ‘in the raw’ before it is encased in the coach body, so don’t hesitate to come and have a look at this unique sight. Additional information will be available on this website when details are finalised. 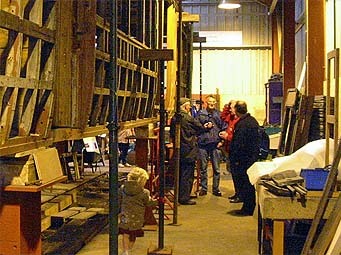 At Llangollen, Dave Owen’s team have done all the preparation work required before work could start on the actual vehicle restoration, such as obtaining containers to provide secure storage for the multitude of components, installing additional high level safety equipment in their workshop, and manufacturing steel support frames to hold the bodies while restoration is undertaken. Trailer No 92 has been placed in store, covered by the tarpaulins that were used to clad No 93 for the journey north as it is proposed initially to concentrate on the Railmotor. The wooden body has now been physically separated from the underframe, the bogies have been removed, the underframe has been shot blasted, and work has commenced on modifying the accommodation bogie to fit under the boiler end of the frames. 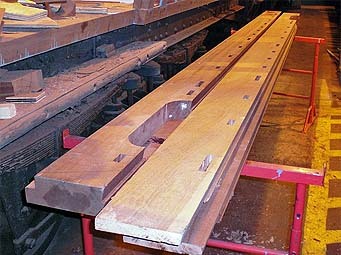 With the bottom rail of the body now totally exposed a full assessment of the timber condition has been done by Don Ware, and replacement wood is currently being machined. Additionally we can also report that to meet the terms of our agreement with the Heritage Lottery Fund, both joinery and mechanical apprentices are being employed on the project. The ‘mechanical bits’ are being assessed for condition prior to any steelwork repairs and the modifications required to return the frames to the original specification. Although we have drawings of both the underframe and boiler / bogie assemblies the modification work required will not be as straight forward as this suggests. We have discovered on a number of occasions that information on some of Swindon’s drawings is not always correct, or to put it another way, the Works did not always follow the drawings. Accordingly we will need to take great care in ensuring that all dimensions and clearances between the various assemblies are correct and make good engineering sense. The adage ‘measure twice, cut once’ will be vigorously applied! The fact that all the parts worked in 1935 will not lull us into a false sense of security.